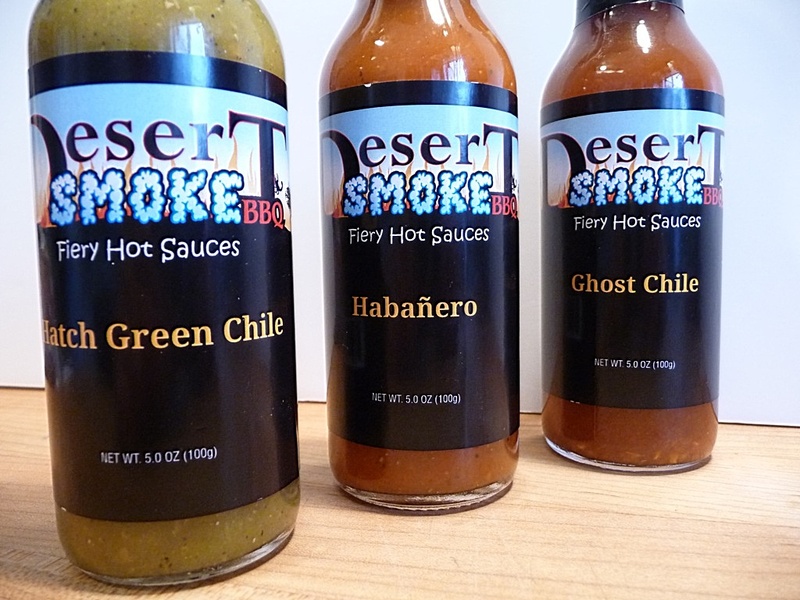 We review their first 3 Fiery Hot Sauce offerings – Hatch Green Chile, Habanero, and Ghost Chile. Fire Roasted Hatch green chiles, vinegar and salt combine to create a tart hot sauce with just enough heat to let you know it’s there. This hot sauce is great as a condiment on anything that could use a little heat or to add flair to your Southwestern dishes. Thick and slightly gloppy. (You may like that, sometimes I do). Lots of flakes floating about of tiny pieces of the roasted chiles along with seeds. It’s a pretty sauce, as if someone took the roasted Hatch New Mexican green chiles, and pulverized them resulting in an almost mash-like consistency. Aroma of smoked green chiles, with hints of citrus (a natural profile of some chiles) and vinegar. The first taste has a big vinegar hit, then a bright roasted chile flavor. Very chewy and chunky. The xanthan gum thickener is a bit heavy in my opinion, but that may be the nature of the beast. Now, I’ve not had a lot of experience with fresh Hatch New Mexican chiles. The closest I’ve come to those authentic chiles was at the Bowers’ PA Chile Pepper Festival, where I was lucky to meet Carol of Southwest Chile Supply and sample actual peppers being flame roasted. We promptly purchased a pound of the chiles for our freezer. BUT – I do know what I like, and I think the overall flavor and finish is true to the fire roasted chile. Very mild with just a hint of chile heat, this sauce still gives you a true Hatch green chile flavor. With a great fresh and authentic Hatch Chile flavor, this sauce is a rarity among hot sauces. I think it would excel on a tostada, or taco, or as a fresh topping on a grilled burger with a hunk of pepper jack or cheddar cheese. Red Savina Habanero chiles, vinegar and spices elevate this humble chile to fiery excellence. Use as a condiment on your favorite dishes or add to soups or stews to add depth, flavor and heat. Their Habanero offering is a true, simple habanero sauce in the purest sense of the word. 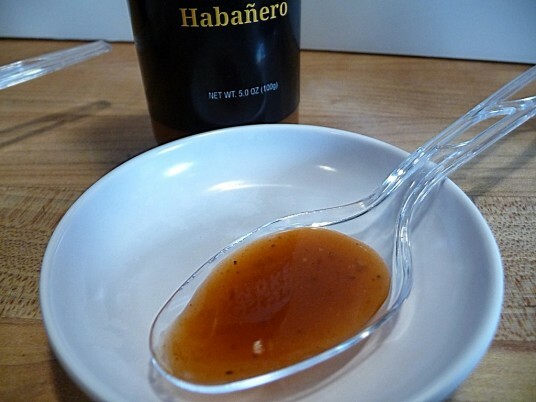 There are no added goofy ingredients to make this your next “Cotton Candy” Habanero sauce. It’s. Just. Habanero. I honestly don’t know how they did it, other than having access to fresh, quality peppers for their recipe. Medium to light consistency. It’s not thin, but is just shy of a medium thickness. Lots of seeds and flecks of spices in a dark burnt-orange colored sauce. Smells like habaneros. I didn’t smell the vinegar at first, which is a plus. This is a pure habanero sauce, in the simplest form – so fresh tasting, that I have to give it high marks. Big giant hit of a traditional habanero heat. This sauce took my breath away – a classic, fresh, habanero hot sauce. I got the hiccups just sampling a teaspoon full of it. I’ve never been a fan of habanero only sauces until recently. And this is one sauce that I would keep on my shelf! In an homage to the World’s hottest chile, we have created this smokey, scorchingly hot sauce for true fire eaters. Your taste buds will not be tickled, they will be ASSAULTED with intense heat and flavor. You have been warned. Add to soups and stews to knock the heat level out of the park, or use sparingly on your favorite foods. The thinnest sauce of this roundup, it’s mildly pulpy with lots of tiny little seeds from the peppers. There are lots of flecks of spicesas well. The color is a dark orange and very plain looking. The vinegar really kicks in with the first taste. Sweet and smoky follows, with a quick, fiery burn in the mouth and a little sweat on the head. A second taste brings on a very good, fresh, bright ghost chile flavor. The finish is a slow burn that coats my tongue. And it lasts. This sauce is not as hot as the Habanero sauce in my opinion, but it has a bigger flavor. The burn is completely different – it shows up in the back of the throat. It’s fuller and richer, with a more complex flavor than the Habanero. 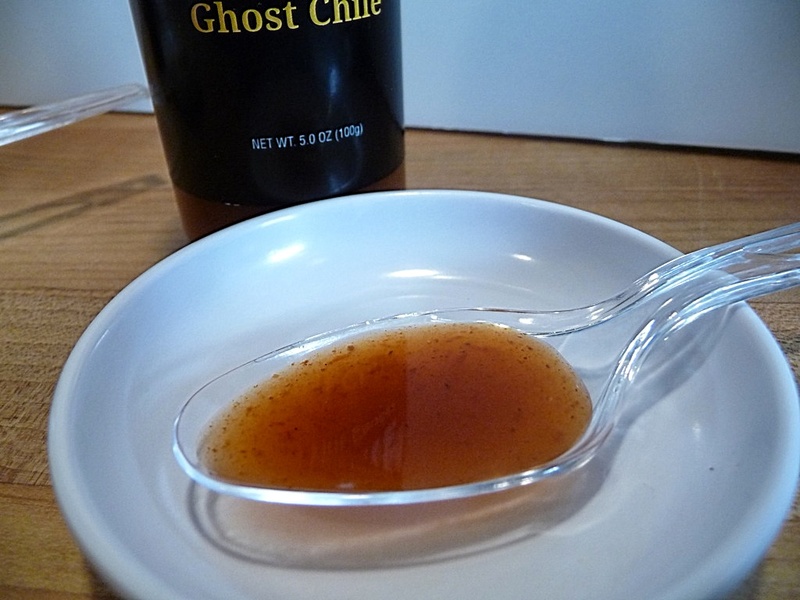 This is a great “starter” sauce for those that want to experience a “ghost chile” or Bhut Jolokia flavor, without getting scared of the name. It is a beginner’s sauce for that flavor profile – one that you need not be too afraid of. All of the Desert Smoke sauces sport the same plain label. Most of the bottom of the label is plain black with the yellow lettering of the type of hot sauce. Above that is the actual logo of Desert Smoke BBQ. I would like to see them take that “Desert Smoke” motif and make it bigger. Then again, there are sauces on the market with very plain labels, that rock. It goes to show you that the label doesn’t necessarily make or break the sauce, but it is something to consider. When you are looking at a shelf full of sauces, a big, plain, mostly black label just might not stand out. Or does it? When all is said and done, I really liked the sauces from Desert Smoke BBQ. The “Hatch Green Chile” is very edible and usable, the “Habanero” is a classic, hot, and very palatable sauce, and the “Ghost Chile” is a great introduction (for some) to yet a hotter, newer chile pepper sauce. What a great trio of hot sauces to have! Visit DesertSmokeBBQ.com for these and their BBQ sauces, and be sure to tell them HotSauceDaily sent you! Love the review! It’s evident you’ve taken the time to taste each sauce and judge it on it’s own merits rather than a quick taste and comparison to other products on the market. I LOVE spice and I feel that your experiences hit he proverbial nail on the head, I am always looking for ways to convey flavors I enjoy in the simplest ways possible, never to reinvent the wheel, each and every product I make must stand on its own and comes from my passion for spicy food! p.s. what did you think of my little jar of fiery loveliness? Tony, thanks for explaining the label(s). I’m afraid my photos didn’t do them justice. With all the details in the graphics, I’ll post a pic of the details soon. Hehehehe, i’m always working on new products in general but I have a few that are pretty close (in the hands of trusted tasters and awating opinions) i’ll let you know when they’re in the wild! I love tangy sauce with vinegar. This is a line that interests me for sure. 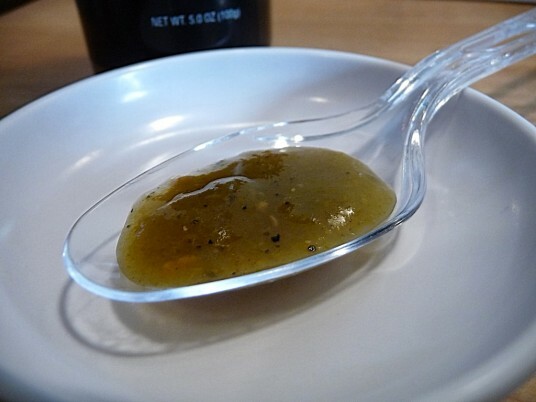 I’ve become addicted to salsa verde in all forms so the hatch chile sauce sounds great to me.